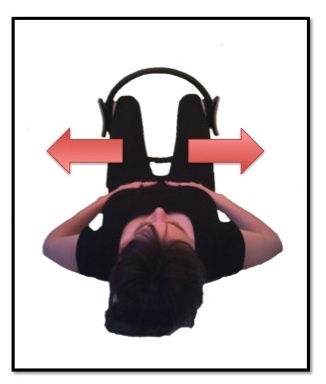 This exercise is intended to strengthen the abductors and external rotators of the hips, while engaging the lower abdominals and pelvic floor. To do this exercise you will need a mat and a magic circle. Start by lying on your back with your knees bent and your feet planted in the ground. Place the magic circle around the outside of your thighs. Inhale to prepare, and then exhale as your press both thighs out into the magic circle. Inhale as you release and then Exhale as you press out again. Repeat this exercise 10-12 times. It is very easy to recruit larger muscles during this exercise. It is important as you execute this motion while keeping your tailbone grounded, and the spine neutral. The pelvis shouldn’t move.